The two hour-plus program will consist of carefully selected highlights from Uli’s entire musical career, which – by now – is spanning no less than 5 decades. The amazing thing is that Uli Jon Roth keeps on getting better, as we have seen amply demonstrated by his astonishing and powerful recent appearances at the G3 Tour of Europe and the UK with Joe Satriani and John Petrucci. In recent times, Uli has successfully revisited the early music of his celebrated Scorpions days which resulted in the superb Scorpions Revisiteddouble CD and Tokyo Tapes Revisited DVD/Blu-Ray releases. The 50th Anniversary set will naturally include the best of that timeless material, including The Sails of Charon, In Trance, Fly to the Rainbow and many other songs. As a logical continuation of Uli’s journey into his own musical past he will also be reconnecting with the second very important part of his unique musical journey – that of his ground breaking Electric Sun period – during which he took the art of electric guitar playing to a completely new and unprecedented level. In those early days, Uli was already forging the path and laying the ground work for later virtuosos such as Malmsteen, Eddie van Halen, Vai, Satriani, Jason Becker and a generation of younger players who came after him, with his novel use of highly melodic, classically inspired arpeggios and scales. Virtually singlehandedly, Uli pioneered a unique style of guitar playing which – for the first time in the history of the electric guitar – combined complete technical mastery of the instrument with an intensely melodic and emotional appeal. Thanks to Uli’s innovative and ground-breaking guitar playing and interesting compositions, Electric Sun became artistically influential and presented a unique blend, which was sometimes likened to a strange mixture, located somewhere between Beethoven and Hendrix. Back then, Electric Sun had many fans in the UK and on both sides of the Atlantic, but Uli decided to move on, and the year 1985 saw the end of Electric Sun as a band concept. It has been more than 30 years since Uli performed the music of Electric Sun in the UK in an unforgettable series of shows which included Hammersmith Odeon, Manchester Apollo and Newcastle City Hall. After all these years, Uli has now taken a fresh look at this unique material, drawn from the altogether three Electric Sun albums: Earthquake, Fire Wind and Beyond the Astral Skies. Uli is reconnecting with his Electric Sun music after all this time and will bring that music to life in the here and now. Electric Sun and Uli fans alike will be delighted to finally hear these songs played live again by the master himself. Don’t miss this chance to witness an important part of rock history. As a guitar player and artist, Uli Jon Roth is in a league of his own as legions of guitar players will attest. Joe Satriani has recently stated in one of his interviews that – of all the guitarists who ever played in the G3 – Uli impressed him the most. Yngwie Malmsteen, Jason Becker and other top-league players agree. Uli’s playing and onstage presence is always inspirational and each concert is a unique event, because of his ability to make his instrument soar and sing emotionally and his spur of the moment improvisations. His musical scope is enormous and ranges from vintage Jimi Hendrix and Cream to the technically much more demanding world of classical music, yet somehow Uli manages to create exciting bridges between these seemingly musical opposite languages. Uli has written classical concertos and symphonic pieces and is equally at home in both worlds, which makes him a unique phenomenon and very rare breed among guitar players. The 50th Anniversary Concerts are going to reflect that, as Uli will play excerpts from his stunning Metamorphosis of Vivaldi’s Four Seasons Concerto as well as several pieces which feature him on classical, acoustic and flamenco guitar. No Uli concert would be complete without some of his interpretations of the guitarist who inspired him the most in his early days – Jimi Hendrix. Because of Uli’s deep understanding and inborn affinity with the artistry of the trail blazing musical genius from Seattle, many see Uli as the perhaps most qualified on-stage persona to imbue Jimi’s original music with the right kind of vibe and true spirit. And to hear Uli step into Jimi’s artistic footsteps live is always an eerie and unforgettable experience. Uli Jon Roth will hit the UK stages with a superb band consisting of younger, extremely talented and accomplished younger musicians, each, a virtuoso in their own right. Together they are a powerful band – capable of playing anything – as we have clearly witnessed on the recent G3 Tour. Niklas Turmann, will be sing lead vocal, in combination with Corvin. The other young talent is guitarist David Klosinski, and together with Uli, those three are performing rare and very exhilarating triple harmony leads, thus doing complete justice to the sometimes-intricate guitar arrangements from Uli’s albums. It speaks volumes for their musical prowess that on the recent G3 tour, both David and Niklas were asked by Joe Satriani to contribute a solo each during the highlight of the G3 evening – the final Jam session. A rare honor indeed. Uli’s voice is his legendary Sky Guitar which is his own invention, and which surpasses all current guitars on the market in terms of range and versatility. It is this instrument which allows him to play with a nigh-on six-octave range. Due to their ingenious design, Sky Guitars are the only guitars which make it possible to play Vivaldi’s celebrated violin concerto The Four Seasons at concert pitch, but with the sound of an electric guitar. 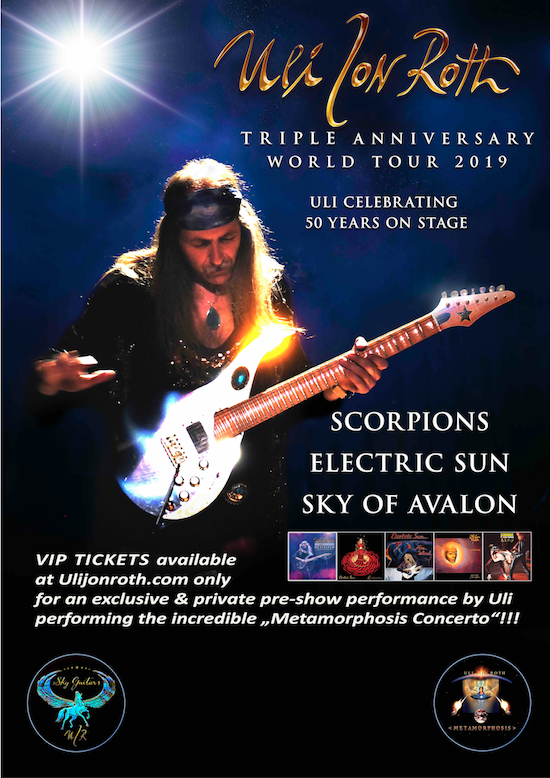 Uli has recently founded his own personal company designed to produce these guitars exclusively – UJR SKY-GUITARS – and he will play a range of his new guitars during these shows. Uli has launched the official UJR SKY-GUITARS website, featuring a range of new Sky Guitars built for discerning guitarists and collectors.. The guitars come in three ranges – Pegasus, Aquila and Unicorn Sky Guitars. Visit www.sky-guitars.com to see the latest models. Stop with the overblown press releases , I stopped after a paragraph lol – I first was aware of my second favorite Roth when I heard the scorpions virgin killer album – he has always reminded me of Michael schenker , Tokyo tapes blew me away – he went kind of new age and spacey and dropped off the hard rock map – maybe it’s just me but I could not get into his original music – it was a little to spacey – I think he will be great live I’m going to see him in Detroit – I hope he can still deliver the goods ! I felt the same posting it, it was quite lengthy-LOL! “My second favorite Roth” made me laugh! My favorite era of Scorpions music included Uli Roth. Taken By Force, Virgin Killer, In Trance….just great hard rock albums, and much harder hitting music than the “classic” Scorpions era. I have to agree those were great scorpions albums ! Tasker, also check out Scorpion’s live album with Uli Roth, Tokyo Tapes. It’s another great live album from the 70’s. In my opinion, Scorpions were just as good in the 80’s as they were in the 70’s. Let me rephrase that, Scorpions were just as GREAT in the 80’s as they were in the 70’s. Thanks & Cheers to both.